…and when you do, you realize how so many chances for change come along, and still, nothing seems to change. Below are some of the images I captured and meant to me the most last year. They gave me an answer – about where we were last year and where we still are today – that I already knew, but didn’t want to hear, nor see. Maybe I had become like those same superficial critics of Baghdadi. Those who disliked what he showed because it was an ugly truth rather than a beautiful lie they preferred that he portray in his movies of war-torn Lebanon. Or maybe, it was that the images of truth hurt so, that it is better to live in the lie of not seeing them, or just look at something else instead. The summer of 2015 promised to be yet another easy and laid back summer, where a despondent population leaves its troubles to roast in the sun, hoping they’ll melt away on their own. Or just put them aside for a couple of months and deal with them in the fall. 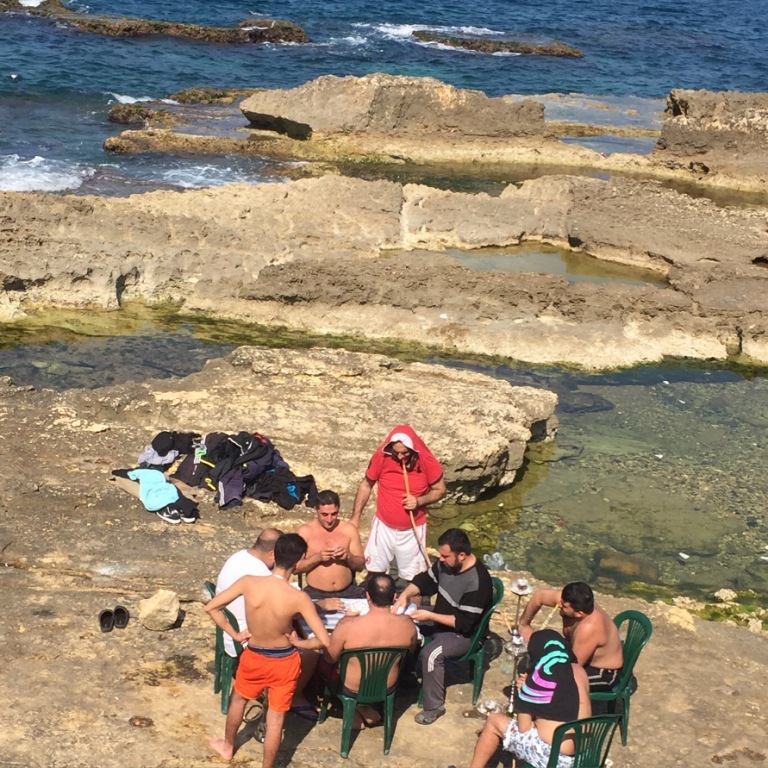 Lazy B Beach, Jiyeh, Lebanon. After the government’s indifference toward the garbage crisis and the unjustifiable violence used against those protesting against it, this was a small example of people’s reaction. 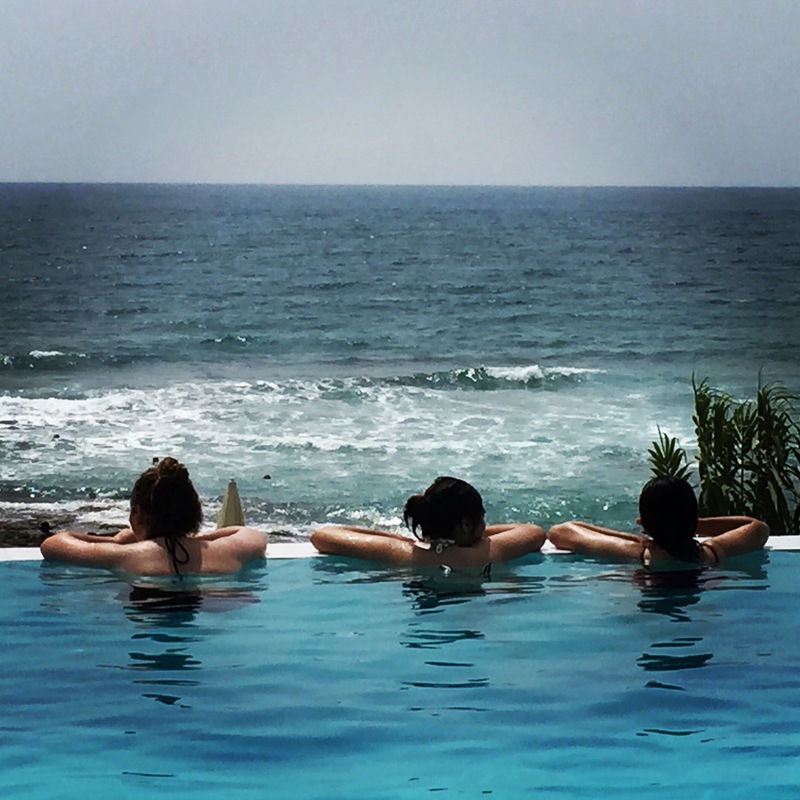 I wonder whether the girls on the pool were there. I know I was, screaming “the people want the downfall of the regime/government.” August 22, 2015. Martyrs’ Square, Beirut Downtown. 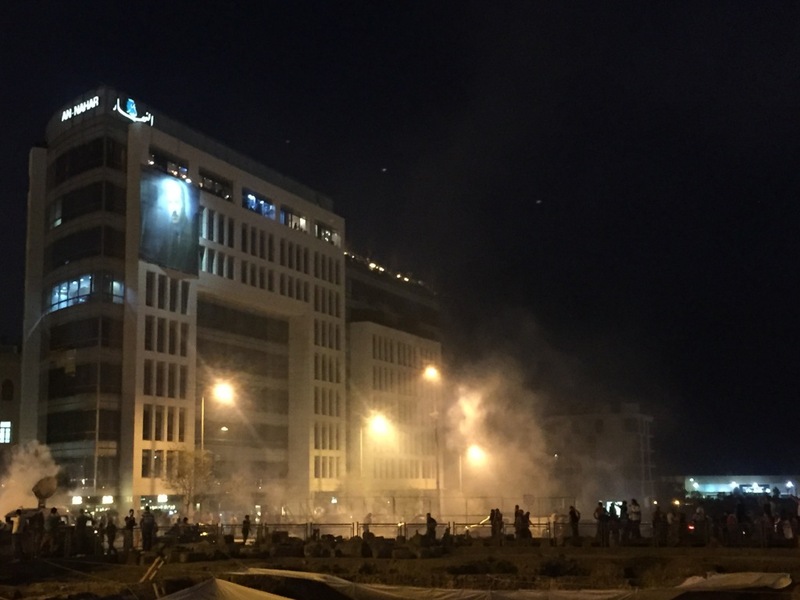 When law enforcement started using live fire, water cannons and tear gas, protesters ran to safety and ran back to the squares to face law enforcement again. There is nowhere else I would have rather been on August 22, 2015. 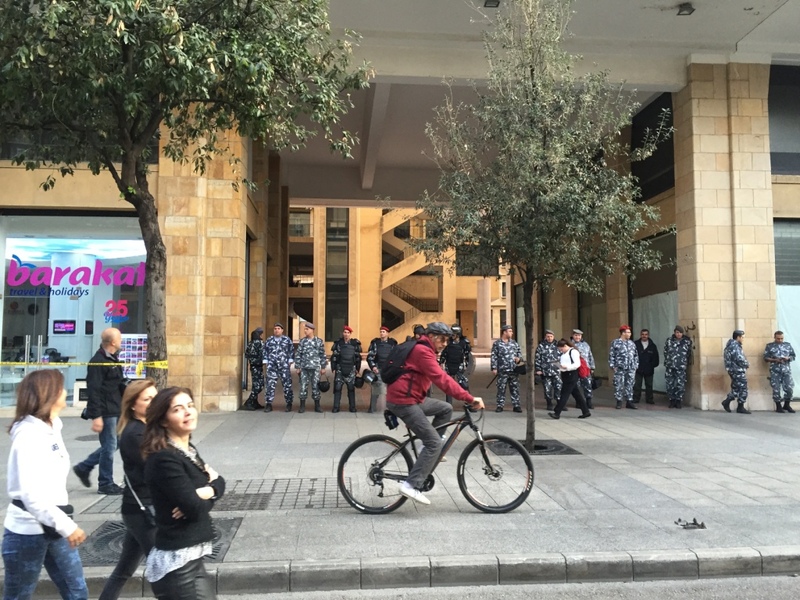 Martrys’ Square, Annahar building. Beirut Downtown. If I could describe last summer in only one word, it would be hope. 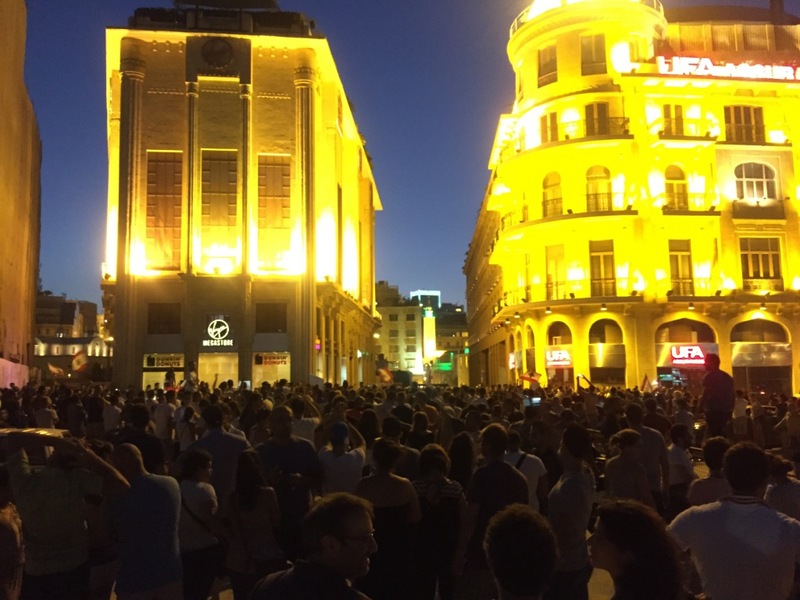 I believed, if only for the moments while being in the squares of Downtown Beirut, that things could change and I would be there to see it happen. Riad el Solh Square, Beirut Downtown. 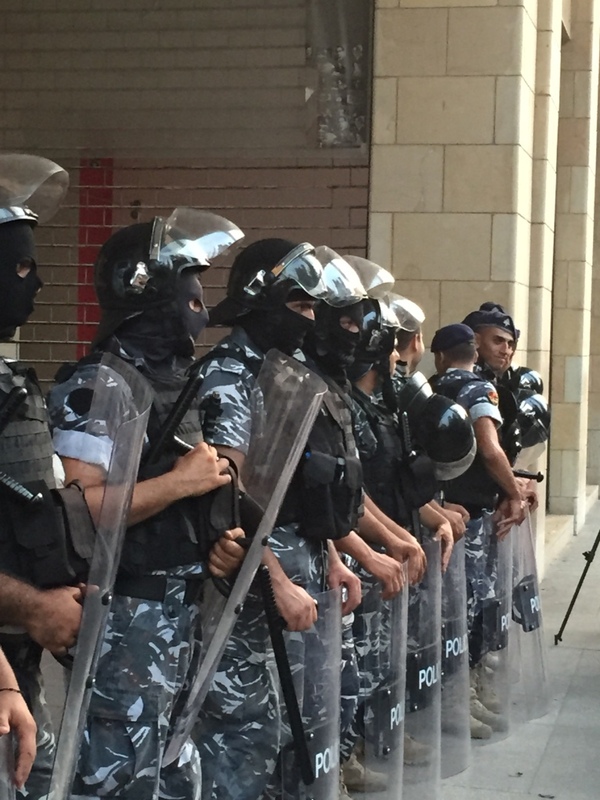 This is how the Lebanese government decided to deal with round the clock protests against its corruption. 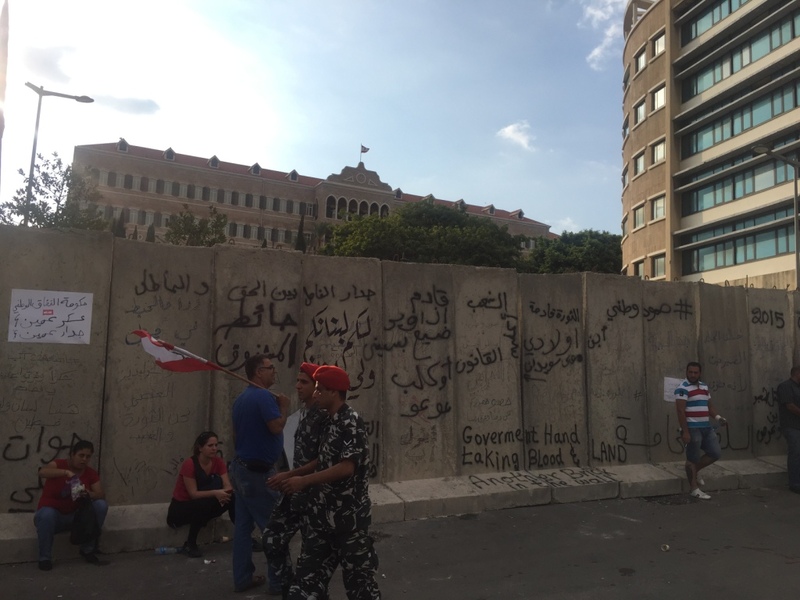 This is the Beirut Wall, mounted and dismantled in around 24 hours, to protect the Lebanese government from its own people, because that’s what democracies do. Riad el Solh, Beirut Downtown. Just as in any developing pseudo-democratic country, the police are used to protect the government from its own people, not the people from those who kill them, abuse them and deny them of their basic rights…and they had a busy summer, last summer. Lazarieh building, Beirut Downtown. 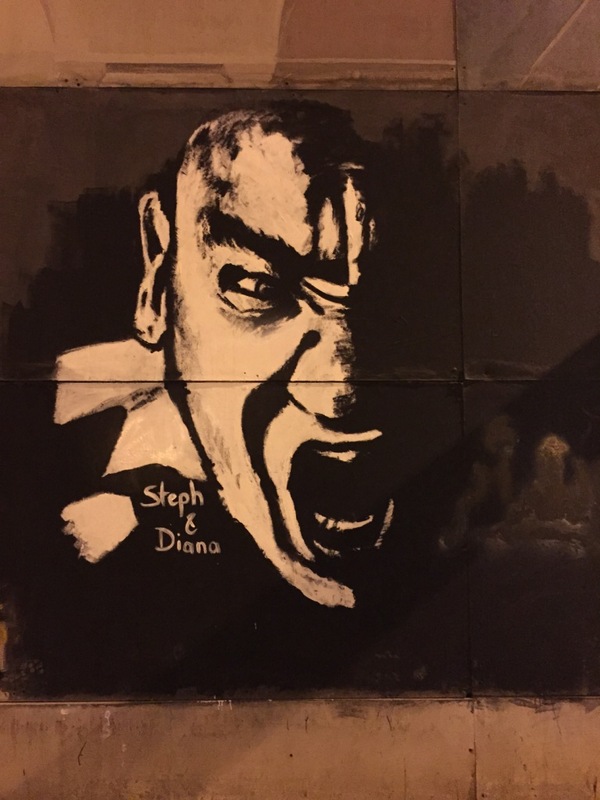 The mood of the summer of 2015 summarized in one angry graffiti by “Steph & Diana” Riad el Solh Square, Beirut Downtown. 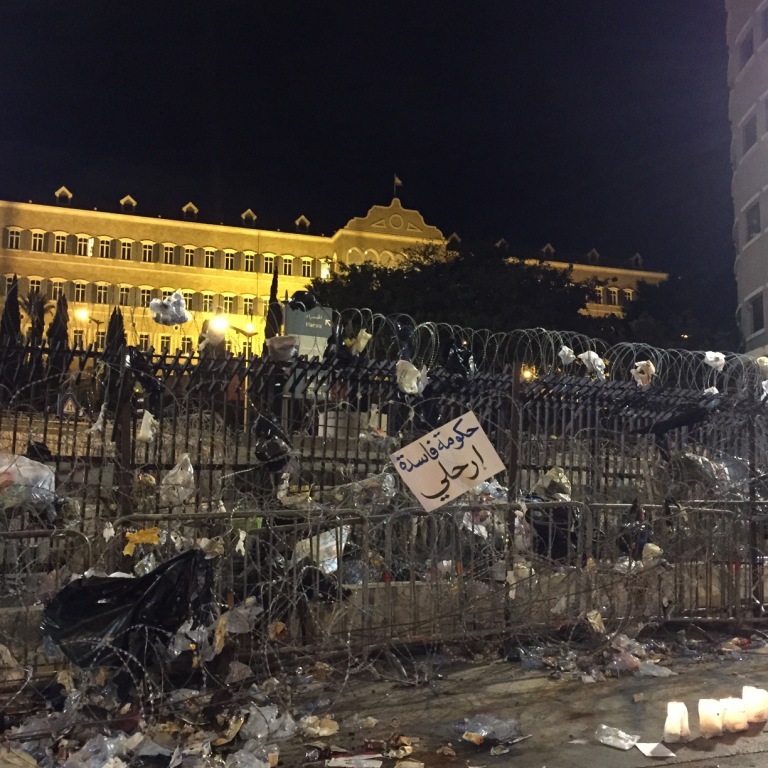 The government, a microcosm of the country’s political class and rotten political system, overlooking its own self: garbage stuck in the barbed wire. 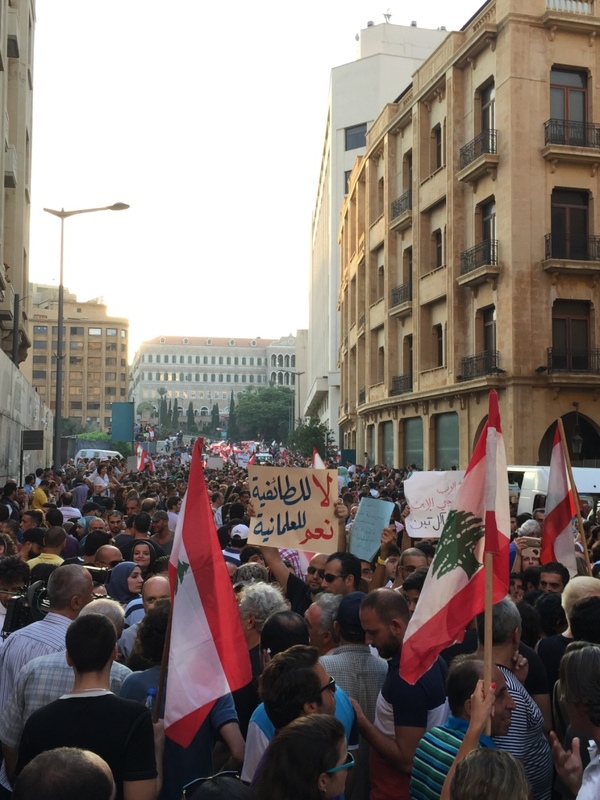 The sign reads “corrupt government, go home.” Grand Serail, Riad el Solh Square, Beirut Downtown. There is something terribly wrong when an entire country looks beautiful from a distance, but the more you get closer, the faster you want to look away. Pigeons’ Rock. Raoushe, Beirut. 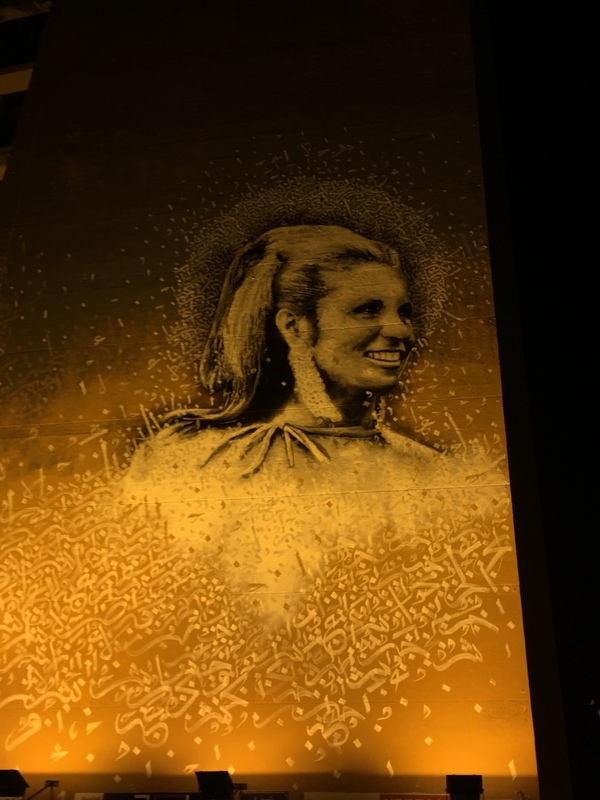 Graffiti artist Yazan Halawani’s depiction of late Lebanese singing legend Sabah. Her passing, along with many others in the past couple of years, felt as if a better, more beautiful, creative, open, deeper and fearless Lebanon is slowly drifting away. Hamra Street, Beirut. 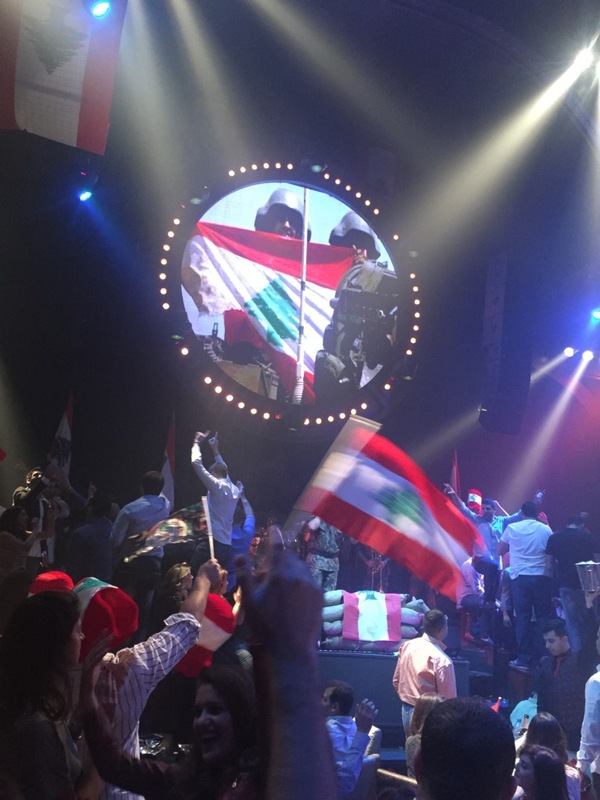 On the eve of Lebanon’s National Day on November 22, revelers celebrate the Lebanese Armed Forces in a Beirut nightclub. If only citizens believed and fought for their country (and I don’t mean with weapons) all year round, as much as they partied in its name that night, maybe things could have been very different. Mar Mikhael, Beirut. 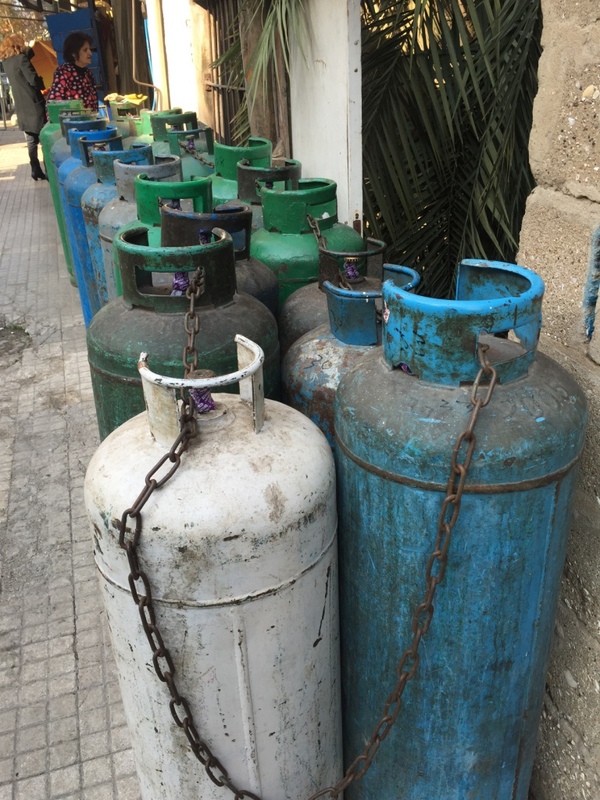 Somehow, when I saw these gas canisters chained to one another like inmates in a high security prison I thought, even the rights of inanimate objects are not respected in this country. What is left, then, of the rights, freedoms and dignity of the people? Bourj Hammoud, Beirut. Bishop Haddad, the Red Bishop of Beirut or simply Father Gregoire passed away in December 2015. He had once said, ‘our time is now,’ to start working for the secular state he believed in and dedicated his work towards achieving. 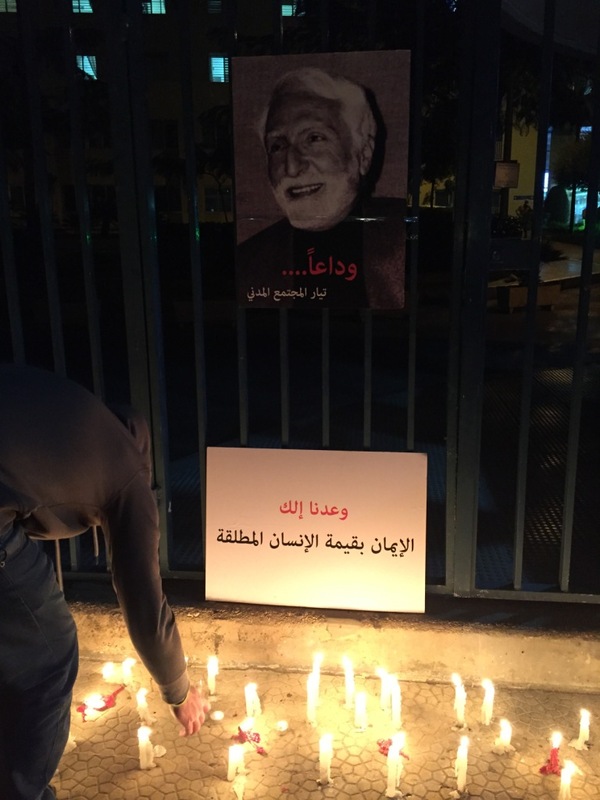 With his passing, I have often thought whether the hope of achieving a secular, united and socially just Lebanon has gone away with him or if he knew better and that could still become a reality one day. Achrafieh, Beirut. 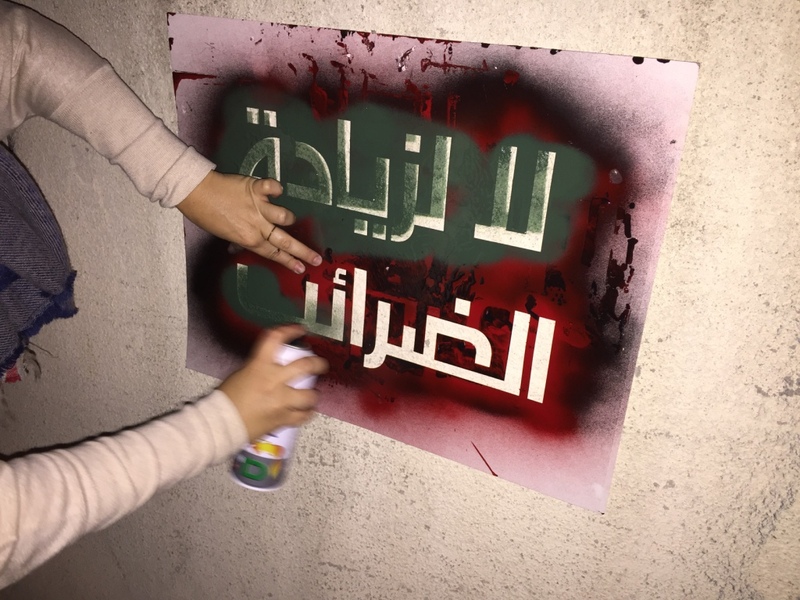 “No to increasing taxes” sprayed on a Beirut wall by an activist from political movement “For the Republic.” In early 2016, the government threatened to increase taxes to solve the garbage problem it had failed to prevent. Some of these same activists were later arrested for a couple of hours, because this is what freedom of expression in a democracy is all about. Achrafieh, Beirut. In a capital city that is on the shores of the Mediterranean in its entirety, its people have barely any decent space to enjoy the sea. But even in the middle of winter, the people of Beirut will find any way of doing so to forget their troubles, if only for a couple of hours. 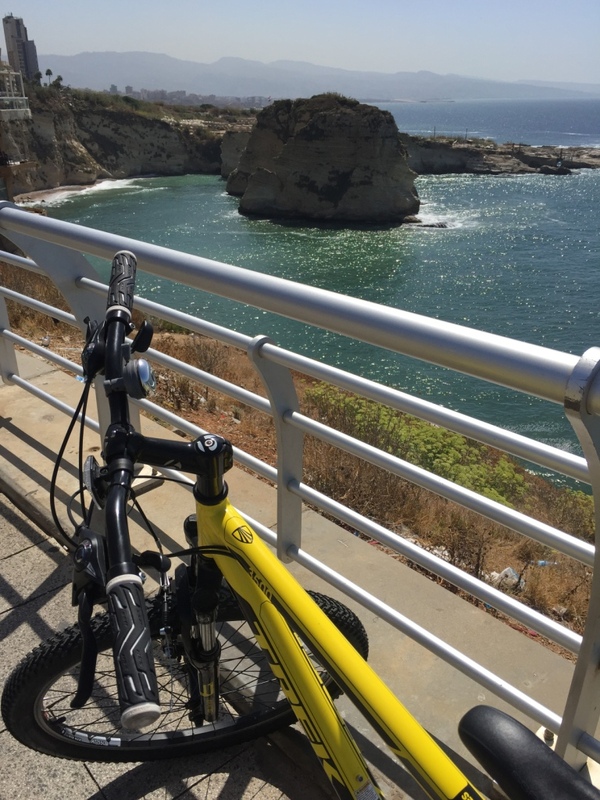 Ain el Mreisseh, Beirut. Protests continued in 2016 for many reasons, not least for the never-ending garbage crisis. However, the mood was calmer, almost festive, too peaceful…as if the anger of last summer was just a dream. Riad el Solh, Beirut Downtown. 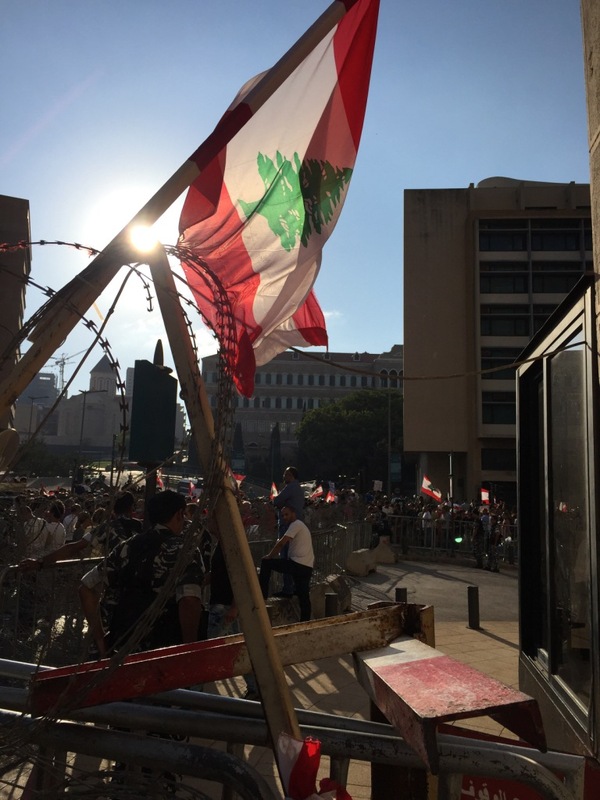 This remains one of my favorite pictures of the past year…taken during those beautiful, adrenaline-filled days where we exercised our right to dream and hope, in the summer of 2015, live from the beating heart of Beirut, which we made our very own. Riad el Solh Square, Beirut Downtown. …but now, when I look back at all this it makes me proud and sad. Proud because I believed, because I never hesitated in taking to the streets and because I tried and didn’t complain that everything was wrong and didn’t do anything about it. But it is also sad, when I realize that nothing much has changed, although I know that it will take years to do so. I still believe that change takes time and that you have to start somewhere and that we may have already started, but change is still far. I fear people have gotten back to their old indifferent selves because of it. I know that something changed last summer, that the political class took notice of the power of the people and their disgust with the rotten status quo, but they too are probably betting that people will get tired and forget and leave them alone to rule the country and steal and know they will be never held accountable for it. If something as basic as a garbage disaster didn’t lead to a minimum of accountability that we sought (for the disaster itself and the way that protesters were treated), a sustainable solution to avoid another disaster, as well as a powerful grassroots movement to face the criminals and corrupt, I do not know what will. Yes, I know we’ve got to start somewhere, and the upcoming municipal elections are a step in the right direction, in a country that has cancelled parliamentary elections twice in less than two years. But don’t keep your hopes up too high. 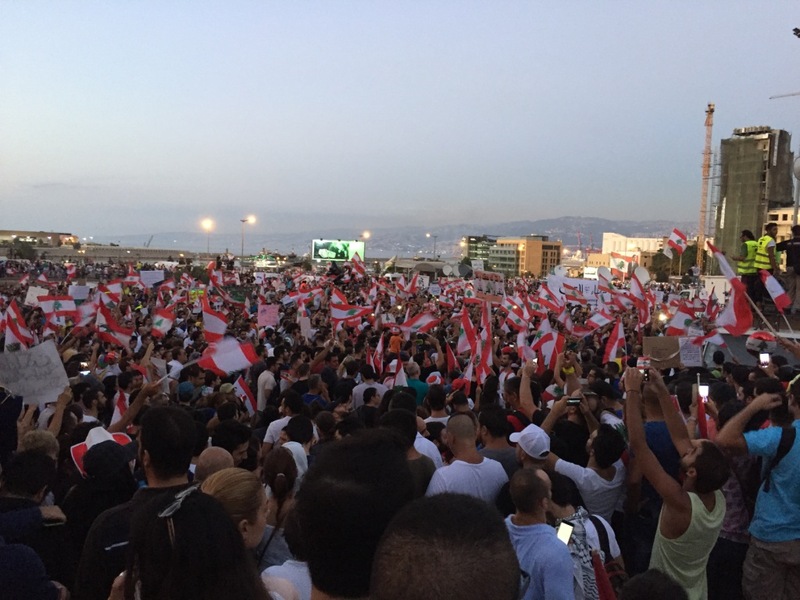 As a recent policy brief by the Lebanese Center for Policy Studies noted, “what Lebanon needs is more than municipal elections.” Indeed, it is about a system that needs to change and much more importantly, about a population ready and with the courage to vote and support change, and not be blinded by fear, sectarianism, corruption and falsely reassured by the status quo, rather than a possibly better alternative they know nothing about.